Location: 20 N American Street – or right off Market on 2nd Street, if you prefer. 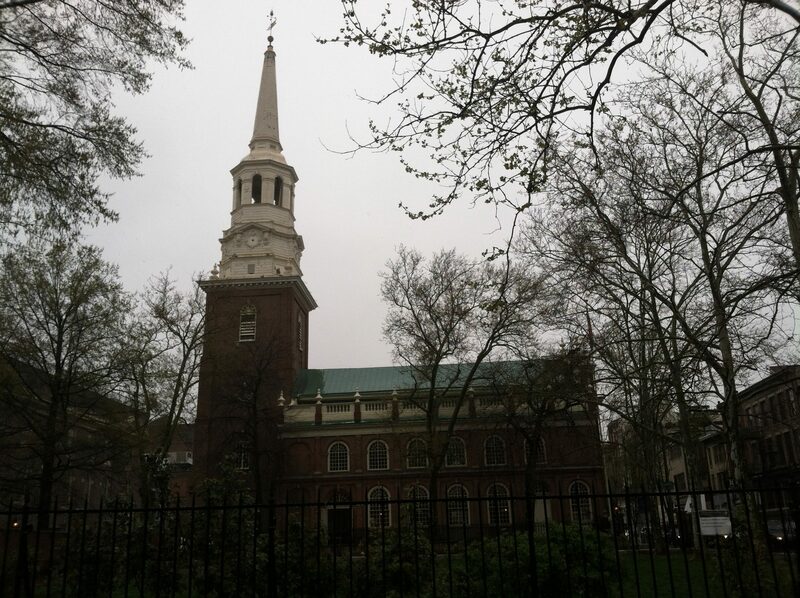 Without a doubt, Christ Church is the most famous of Philadelphia’s many historic churches. Its parishioners have included Benjamin Franklin (who, according to legend, would sit in the back and be the first to leave), Betsy Ross, Robert Morris, George and Martha Washington (who also attended at St Peter’s), Benjamin Rush, and John Penn. It was the first parish of the Church of England (now Episcopal) in Philadelphia, to which most Philadelphians belonged. The church itself is built in a very classic Georgian style, which fits a building that age. It’s mostly brick, with a steeple that was once Philadelphia’s tallest building. The steeple is a prominent Old City landmark, and one that is visible from other parts of the city. The interior of the church consists mostly of white paint and clear glass windows, which was typical for churches of this era. The organ is quite impressive, however. There are also columns that lead to the barrel-vaulted ceiling, that are attached to the balcony that cleaves the main part of the church. It’s a very simple yet effective design. The chandelier over the altar is quite nice. Some interesting things in the church include William Penn’s baptismal font, in which Penn himself was baptized as an infant. Benjamin Franklin’s children were also baptized here. Also, a variety of people are interred throughout the church, meaning there are graves throughout the center aisle. The pews that famous people such as Franklin, Washington, and Ross, are marked individually. It was also one of the churches presided over by William White, the other being St Peter’s. Admission is free, although you may donate if you wish. Guided tours are also available.